The Aggregator widget provides you with the ability to create a single aggregated instrument made up of multiple contracts and trade it as a single instrument. You can view an aggregated instrument in Market Grid and MD Trader, and you can trade an aggregated instrument with routing rules that determine where orders are routed. Smart order routing — Aggregator allocates the user's desired quantity across the leg instruments to achieve the optimal price based on user-specified configuration settings and server side best execution implementation. Rebalance — Aggregator allocates orders across the leg instruments, then continuously monitors all leg markets for liquidity that is immediately available for taking. When a liquid market is detected, Aggregator rebalances resting orders across the legs to take the liquidity based on the user-specified configuration settings. You can open Aggregator by clicking Widgets in the title bar. When the widget is minimized in your workspace, the Aggregator icon appears in the title bar. 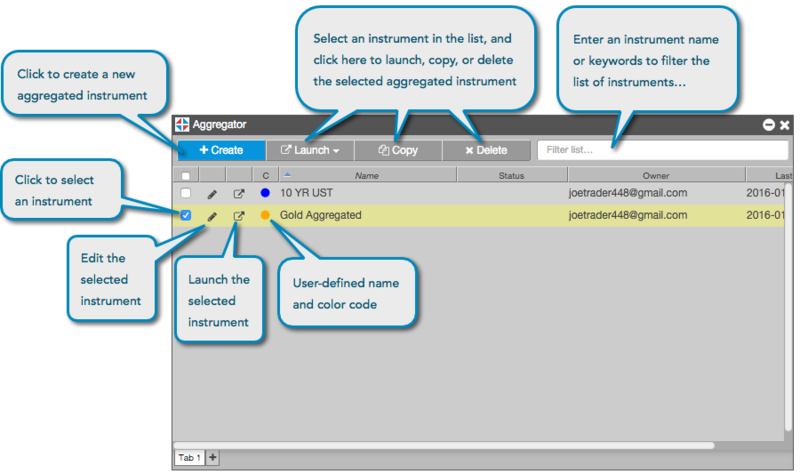 Note: In addition to using MD Trader, you can drag and drop aggregated instruments from the Aggregator Manager window to the Market Grid.